Tucr.io was Adopted by Google! 24 Jan Tucr.io has been Adopted by Google! No, seriously, Tucr.io was adopted by Google ! 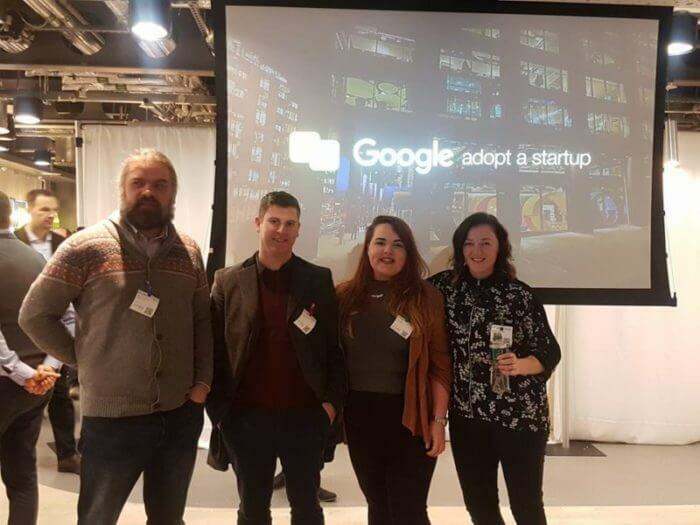 Here at Tucr HQ we are delighted to announce that we have been chosen take part in Google’s 2017 Adopt a Startup Programme! The Google Adopt A Startup programme is a 12 week mentoring programme that leverages the skills and expertise of Google EMEA Consultants with high potential start-up companies, like ourselves! The programme provides skill based mentoring to these companies. It offers lectures on a variety of topics such as Google Adwords, Google Analytics and Design Thinking and helps companies structure for scale. The Startups meet their Google Support teams multiple times throughout the 12 weeks to discuss business strategies put in place in order to get the most out of the programme for the Startup. Back in late 2016, Tucr applied to be a part of this programme, with over 100 other entries from around Ireland. Not only are we the only start up in Waterford in the programme, we’re flying the flag for the whole South East. Along with Tucr, there are 30 other start-up companies working with the programme – 25 from Dublin, three from Kerry and two from Galway. Mentoring – Peter, Killian and Paul adopted us. We are lucky to be mentored by Peter, Killian and Paul, three of Google Ireland’s Digital Consultants at their HQ who have already dubbed themselves as ‘team friar tuc’. Together with the guys, we will be working on making Tucr bigger and better for retailers and shoppers and have set ourselves goals to achieve this over the 12 week programme. The Launch Party for the program was at Google HQ in Dublin on the 17th of January. It gave Startups the opportunity to meet their Google Support team that they will be working with. It also allowed for the Startup to network and get to know others involved in the competition. We couldn’t believe the talent that was represented at the Launch Party. We are definitely in great company and are looking forward to learning form our peers. Yes, as well as being an excellent learning process for all the Startups involved, it is a competition. On March 28th and 29th, each Startup gets the opportunity to pitch their re-developed business plans and progression results of the progamme to members of the Google Management team. Based on these presentations, eight of the Startups are chosen to present at the Adopt A Startup Final. At the final, the Startups present their growth to members of Google Ireland’s leadership team, alongside prominent figures from the Irish Startup Community at a Grand Final in Google EMEA HQ. There is a chance to win some fantastic prizes, such as Adwords credit. We’re looking forward to this challenge and our aim is to smash our goals and take to the stage crowned as Google Adopt A Startup Winners 2017. Team Tucr are braced for a mega 12 weeks!